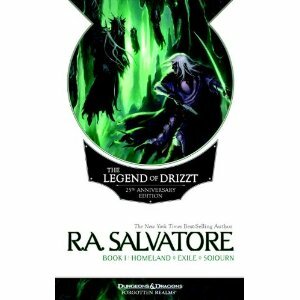 It has been many years (13 or so) since I read the tales of the Legend of Drizzt Saga. For those who are familiar with this series, the name evokes memories of adventurous tales of grand action. For the uninitiated, these books are perhaps the definitive experience for those wanting to read fantasy works set in the universe of Dungeons and Dragons. Nerd hats on, everybody. Here, I review volume II of the Legend, which contains the Icewind Dale Trilogy: The Crystal Shard, Streams of Silver, and The Halfling’s Gem. The “Icewind Dale Trilogy” is a fast-paced fantasy adventure following Drizzt and company as they fight enemies, get pursued by assassins, and more. Salvatore does an excellent job here of keeping the action moving. The books never seem to drag–a problem that existed in the Dark Elf Trilogy. Here, readers are thrust into action scene after action scene without letting up. This was an excellent decision because that also means there is little time in the whirlwind of activity to reflect on the total coherence of the story. More on that later, but for now it is worth noting that at no point did I feel like these books dragged or that the story had crawled to a stop. The overarching plot isn’t quite as cohesive and interesting as the Dark Elf Trilogy’s was. This trilogy feels quite a bit like a Dungeons and Dragons campaign with a few points linking all the adventures together. It just is not as tied together as the prequel trilogy. Although enemies do persist and there is a general sense of a broader world, there is little sense I do have to wonder, too, why it is referenced as the “Icewind Dale Trilogy” when, realistically, only the first book deals much with Icewind Dale proper. It’s a minor complaint, but there it is. The part of the stories that I think I enjoyed most when I read these books so long ago was actually the part I most frequently found myself skimming this time around: the action. I know I already talked about how it is good the books stay fast-paced, and it is. My point, though, is that a lot of the fights feel very similar. Scimitars slash, hammers whirl, axes cut in half, bows fire–all with abandon. But after a while it feels like the characters are just going through the motions. The fights began to get meshed together in my mind, with just settings and a different order of enemies slain to differentiate them. They’re clearly choreographed and thought out, but–maybe this is a symptom of being older–I just wanted more plot. What Salvatore did do quite well regarding the plot, however, was character development. Each main character (and indeed most of the secondary characters) felt like real people with motivations and personalities that were generally distinct. Whether it was Cattie-Brie or Bruenor, Wulfgar or Drizzt, the characters were all well written and interesting. Moreover, the villains themselves were intriguing and had enough backstory or mystery surrounding them to keep me interested. Overall, the Icewind Dale Trilogy was a solid read. It’s not going to blow readers away with the plot, but it will provide several good afternoons full of sweeping adventure. And really, that’s much of what fantasy is all about. -Why is it called “The Icewind Dale Trilogy”? 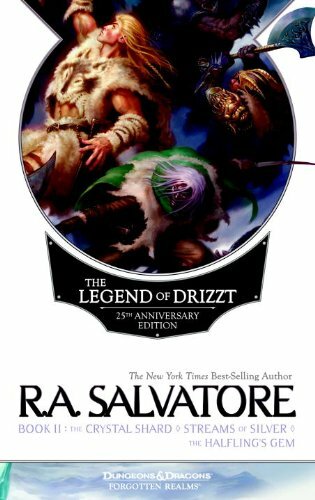 It has been many years (13 or so) since I read the tales of the Legend of Drizzt Saga. For those who are familiar with this series, the name evokes memories of adventurous tales of grand action. For the uninitiated, these books are perhaps the definitive experience for those wanting to read fantasy works set in the universe of Dungeons and Dragons. Nerd hats on, everybody. I recently decided to re-read the adventure and picked up an omnibus edition labeled “I” for the Legend of Drizzt. Interestingly, they opted to put the prequel, “The Dark Elf Trilogy” first rather than putting them in published order. No matter! We begin our foray into the Drizzt saga with the Dark Elf Trilogy. I’m not going to summarize the plot (see summary here [click each book for more summary]), but the basics are that there is a Dark Elf (AKA Drow) named Drizzt Do’Urden growing up in one of the cities of the Drow, Menzoberranzan. He and his father, Zaknafein, do not conform to the moral corruptness and insatiable lust for power that perpetuates in Drow society. Because of this, Drizzt rejects his people and flees into the Underdark, where he meets some friends as he avoids encounters with his deadly family. Finally, he emerges on the surface. I have to say I enjoyed re-reading the trilogy very much. The world is particularly well developed, with a true sense of vastness and complexity that makes readers excited to explore further. The story also has a pretty broad scope, stretching across years, conflicts, and realms in order to bring it to fruition. The setting is pretty phenomenal. There is surprising depth to some of the moral issues raised in the book, despite having a fairly simplistic view of good and evil (see characters, below). Drizzt’s struggle to reconcile his moral compass with his upbringing is intriguing, and his father’s own struggles observing Drizzt is emotionally engaging. It’s pretty impressive that Salvatore included a decent depth of these issues in a series that is, at base, a tie-in for a role-playing game. The action, when it happens, is always intense. Although the action scenes are perhaps not as well-executed as some other stories’, they are engaging and hard-hitting when they do happen. I was never bored or put off by them, which is sometimes hard to do. Too much action or poorly written action is worse than no action at all. That said, there are some pretty big issues here. The most obvious one is there are major issues with pacing in these books, particularly in Exile. It felt like there were stretches of 50 or so pages in which almost nothing happened. Drizzt is in a tunnel. He is lonely. He encounters a beasty. He is sad. These sections drag on for seemingly interminable lengths and make reading the books at time feel like a chore. Thankfully, the style they’re written in makes them very quick reads, so it is easy to churn through these sections, but it remains a major difficulty with the trilogy. Another issue is that most of the characters lack depth. There is little backstory or even hints of backstory to them. Characters are sorted into simplistic black-and-white good-and-evil categories that make it difficult to care much about what backstory there is at points. There are exceptions, like Zaknafein, but overall there just isn’t much to care about for the other characters. Overall, “The Dark Elf Trilogy” is an enjoyable read that I’m glad I took the time to go back through. It’s been a long time since I’ve visited these books, and I’m intrigued about what will come next! Never to Live is madness. The main character, Elwyn, is tortured into madness after she agrees to try to stop an ancient evil. The book then follows Elwyn and a cast of characters on an adventure which seems as disjointed as Elwyn’s mind. There will be SPOILERS below. Terms are introduced with little-to-no definitions anywhere in the book. Things like “loxasta” are mentioned but their role is never clearly defined nor is there ever enough description to know what they might be motivated by. Locales are as bare bones as possible, often with no description so that it comes as a surprise when someone steps out from behind a tree (after all, how did we know trees were here when there was no description?). Characters similarly have almost no detail, with readers left to try to fill in the pieces of their motivations, descriptions, and backgrounds. All of this is a bit surprising in a book that comes close to 700 pages. What is done with those 700 pages? The first 100-200 pages are largely a trip through the mad mind wanderings of the main character, Elwyn. There’s not enough detail to explain why these memories are chosen or what context they might have or how, exactly, the torture is happening or even really for what reason. Yes, hints are dropped, but they never meld together to form anything coherent. The next 400+ pages are basically just following the set of characters–largely without motivations–through a journey through the land. During this journey, one character discovers the ability to turn into a dragon, another starts sprouting roots (! ), others discuss their thoughts with a demonic character, a dragon shows up, a were-panther follows Elwyn around (why? ), and more. All of this makes sense, in a way, because Never to Live never sets ground rules for how the world works. There are no apparent restrictions on the possible, so having characters randomly start turning into a plant only to reveal later a link between that and a covenant with the dryads–another faction without any background (along with the loxasta, the “kings”–apparently some malicious rulers of some land, though it’s never entirely sure which land where or why, etc. )–seems almost reasonable. The problem is that because there seem to be virtually no rules, no descriptions, and no background, the book never gets its feet grounded in a reality that readers can relate to. It seems entirely disjointed throughout, with little reason to care about what’s happening. Even when the story starts to wrap up (page 600 and following), some threads are tied, but completely new open-ended thoughts are introduced, like a horse that apparently was Elwyn’s son the whole time. The ending is probably the best part, but it does little to tie up all the loose ends or even make sense of the world in which the story takes place. On the plus side, there are some interesting points brought up by a character named Weaver–possibly a God stand-in but it is never clear–regarding theology and philosophy. Moreover, the exploration of self-worth and the concept of reducing a main character to madness is intriguing, it just doesn’t work as portrayed in this book. 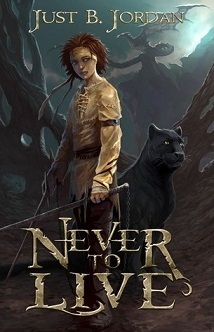 Never to Live is a tough read. I re-read multiple sections, even going back and re-reading the introductory chapters a few times after things related to them popped up later in the book. Even after that work dedicated to the book, I am left with the conclusion that it is, unfortunately, a jumbled and faceless outline of a story rather than a complete story on its own. At times incoherent, and on the whole lacking in development, Never to Live is a sometimes tantalizing mess. I received a review copy of this book from Enclave publishing. I was not influenced or required by the publisher to write any kind of review. Just B. Jordan, Never to Live (Colorado Springs, CO: Enclave, 2009). What’s a “Microview”? It’s a miniature review of something! I doubt that I coined the phrase, but I just randomly thought of it today so I’ll claim it for now. With a Microview, you, dear reader, get exposed to random things I read/watched/experienced in a very short form. Because this is the first, I’d love feedback from you on the format! 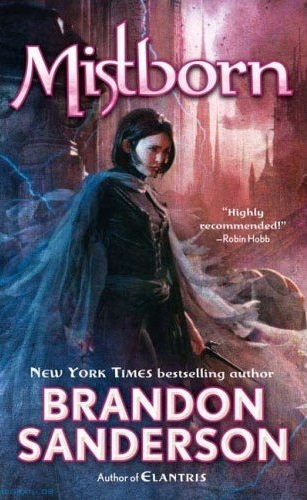 Brandon Sanderson’s Mistborn features the coolest magic systems I’ve ever read. It’s truly unique and worth reading the book for that alone. However, the plot is also fantastic and Sanderson masterfully weaves a history of the world into a book filled with action and intrigue. Vin and the other main characters are very interesting and each has a past that makes readers want to know more. Philosophical and theological problems are also briefly addressed throughout in ways that inspire reflection and thought. -Brings up issues of worldview in ways that demand engagement. Overall a fantastic book that I would recommend you immediately go and read. Redwall, Bonhoeffer, and one awesome dream. I had an awesome dream a few nights ago. Before I’d gone to work, I was paging through a book I’ve been wanting to read for a while* [see end of post for more info on the asterisked portions] and it mentioned another theological topic. ** I remembered I once owned the book it cited*** and I wasn’t sure if I still had it (I thought I may have sold it). But then I had to leave for work so I wasn’t able to look for it. I got home very late and fell asleep pretty promptly (I am an expert at sleeping). I then had the most wonderful dream in which I was desperately searching for the book that was cited in the other because I NEEDED it because… well, you know, books. I think there was some other desperate reason I needed to find it, but during the dream I felt the primary motivation was because I wanted to read it and I was really hoping I hadn’t sold it. I knew where to find it but I didn’t spot it. However, I did find a boxed set of the “Martin” storyline of Redwall books (if you don’t know them, you should–they’re wholesome, awesome, fascinating reads for young adults/children). 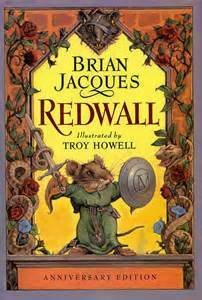 These books were not actual Redwall books, though. They had titles like “King” and “Kingmaker” and “Mariel the Queen” [the last is most similar to an actual title]. They were in a gorgeous box set and they all featured art which looked like Redwall but they had a gold foil over them. Their spines combined to make a beautiful panoramic of Redwall Abbey and the surrounding forest. But most importantly of all, there was a Redwall book titled “Bonhoeffer.” Yes, my subconscious concocted such a delightful fantasy as a Redwall novel in which one of the characters was a mouse styled after Dietrich Bonhoeffer, the wonderful German theologian who was executed by the Nazis for his opposition to Hitler. Oh yes! I can’t help but desire to flesh out his story more. Perhaps there was this little field mouse who stood up against the evil Wolf named Lupis Hitlerus or something like that. The Bonhoeffer mouse would have glasses like the man himself did, two circles, and he would look very German (or as German as a mouse can look). Lupis would be viciously persecuting red squirrels because he didn’t like how they looked. Bonhoeffer-mouse would defeat the Wolf in his own self-sacrificing death by inspiring others (probably badgers shouting “EULALIA!”) to come to whatever land he lived in and save the squirrels. Can you say EPIC FAN FICTION? I can. Anyway, I did wake up and immediately pulled over a step stool to find the book that had been cited. So not only was the dream amazing, but I also actually did have the book! Fantastic! What’s the strangest combination your subconscious has come up with for a dream? Check out my main page (J.W. Wartick- Always Have a Reason) or like me on Facebook for discussion of theology, philosophy, movies, apologetics, and more! Hello to anyone reading this. I’m J.W. Wartick and I’m already a fairly regular blogger over at my main site, Always Have a Reason. That site is itself about philosophy of religion as well as Christian apologetics, theology, and science. But I have way more interests than I could contain on just that blog. I have a fascination for history, science, and the arts. I love reading sci-fi, fantasy, and history. Paleontology and archaeology fascinate me. I love playing role-playing games and driving franchises in Madden. In short, I need an outlet for all these things–a place for me to just reflect on my interests that don’t seem to fall under the umbrella of my main site. There is too much going on in this head to keep it all in. You, the reader, may find this diverting. I know how interesting it can be to explore the random thoughts of people. Hopefully this site will lead you to some new interests, or perhaps you’ll comment and help lead me off to learn about things about which I know little or nothing. You, the reader, are therefore asked by me, the author, to leave your own reflections on the topics I present here. Or, if you desire, you can just post about other random interests of your own. When I put up a post on the Battle of Midway, you can respond by talking about Gettysburg. That is fine! Please do so! Finally, readers are entitled to a bit of background about myself if we’re going to have engaging discussions. I’m a Christian theist who loves a good debate. I’m getting an M.A. in Christian Apologetics. Philosophy of religion is my primary interest, but as you read on here you’ll find I have interests all over the place. I’m a devoted Christian who believes that the evidence for Christian theism is quite strong (if you want to read on that, you should check out my main site). You’ll note, then, that theism–indeed, Christian theism–permeates my posts, even when I’m talking about things unrelated to it. I’ll not apologize for that. We all let our worldviews into every aspect of our lives. I hope as you read here you’ll find some questions to ask and, maybe even some answers.